The SmartGPS is a development tool that will help you understand GPS technologies. Connect GPS (Global Positioning System) to your PC or development board using the LEA-6S module. The intuitive design of SmartGPS guides you through the process of learning GPS. 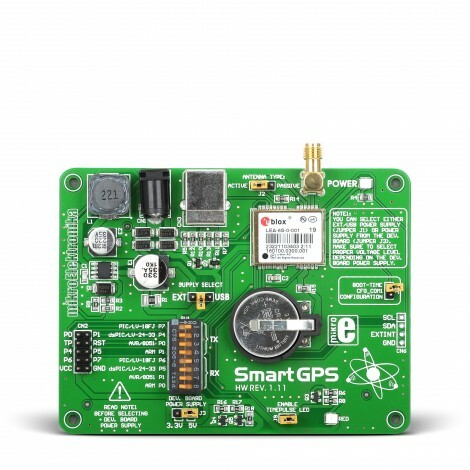 SmartGPS Board is a compact solution for adding GPS functionality to your device. It features popular ublox LEA-6S module, power supply circuit, USB and antenna connectors, li-polymer battery for data retention and IDC10 header for connection with the target board. Board has DIP switches for flexible choice of communication lines with various development systems. Communication is done using UART or USB interface. Board can be used with a microcontroller, or data can be acquired using PC application through USB. All communication lines can be driven with 3.3V or 5V logic.